Tue., April 4, 2017, 8:04 a.m. The oval mixed-cut diamond smashed the $60 million pre-sale estimate set by Sotheby’s when it went on the block. The sale comes three years after the gem was sold at an even higher price at another Sotheby’s auction in Geneva. That deal later fell apart after the buyer defaulted. It was sold for a hammer price of $63.0 million, not including the buyer’s premium. Sotheby’s says the buyer is Hong Kong jewelry company Chow Tai Fook , which beat out two other telephone bidders. Until now, the most expensive diamond ever sold at auction was the “Oppenheimer Blue,” which fetched 56.8 million Swiss francs (then $57.6 million) last May. The previous world auction record for a pink diamond was $46.2 million for the 24.78 carat “Graff Pink” in 2010. 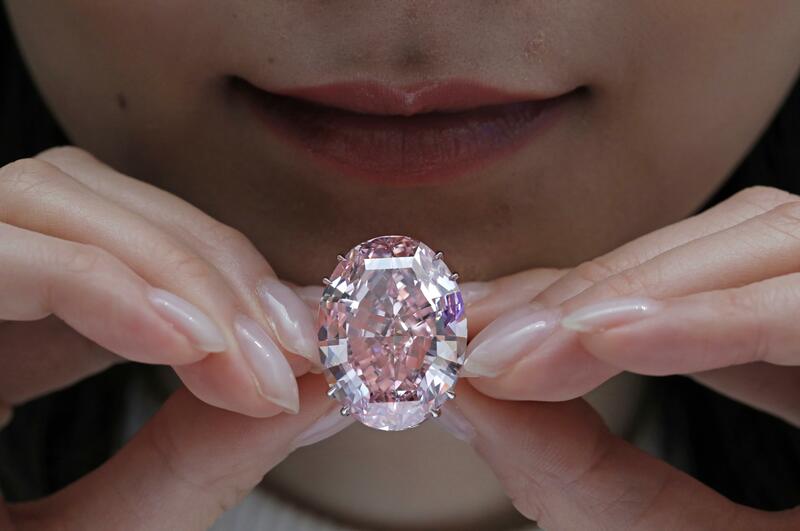 Sotheby’s decided the time was right to bring the diamond back to the market because of rising demand from wealthy Asian buyers. “The Asian element in the jewelry market is extremely important and from what I’ve been hearing from members of the trade I’ve been talking to, in the last six months they have become more and more important,” said David Bennett, chairman of the auction house’s jewelry division. The “Pink Star” was mined in Africa by De Beers in 1999 as a raw 132.5 carat gem and cut over a two-year period. In November 2013 it was auctioned for a record $83 million to New York diamond cutter Isaac Wolf. However, Sotheby’s revealed months later in its 2014 earnings report that Wolf defaulted on the transaction. The auction house was forced to buy the diamond from the seller because it had guaranteed a $60 million sale price. Last year it sold an unspecified stake in the diamond to two companies, diamond specialist Diacore and New York jeweler Mellen Inc. Published: April 4, 2017, 8:04 a.m.